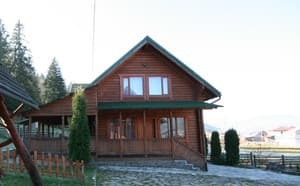 Описание номера: On the ground floor there is a living-dining room with a fireplace and a sofa bed, a kitchen and a bathroom. On the second floor there are double rooms with double beds. 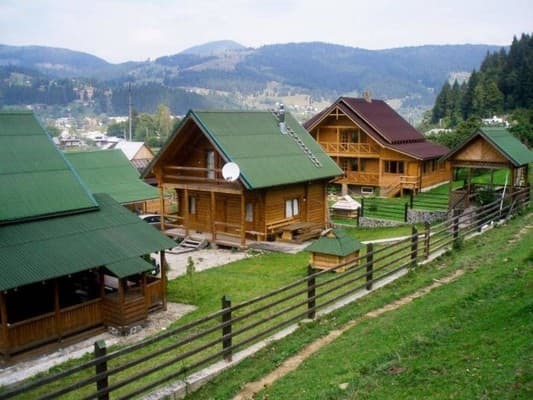 Описание номера: Cozy 2-storey wooden cottage with everything you need for a pleasant stay. 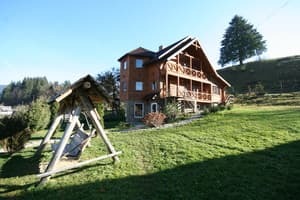 On the ground floor there is a living-dining room with a fireplace, a sofa bed and TV, a kitchenette, a double bedroom (2 single beds that extend) and a bathroom. On the second floor there is a double bedroom (2 single beds that extend), triple (double and single beds). Each room has a TV and a bathroom. The cottage can be rented by numbers. 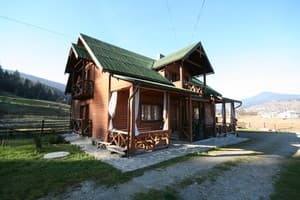 Описание номера: On the ground floor there is a living room with a fireplace, a kitchen (refrigerator, microwave oven, electric kettle, electric stove, sink, necessary utensils), a bathroom. On the second and third floors - 2 double rooms (double bed, TV, wardrobe), bathroom. The cottage can be rented by numbers. Description of the room: Cozy 2-storey wooden cottage with everything you need for a pleasant stay. On the ground floor there is a kitchen (fridge, microwave, electric kettle, electric stove, dishes); living-dining room (sofa bed, TV); double room (double bed, wardrobe, TV); bathroom (toilet, sink, shower, hairdryer). On the second floor - 3 double rooms (each - double bed, wardrobe, TV); bathroom (toilet, wash basin, shower, hair dryer); balcony. Near the cottage there is a gazebo with a fireplace and a swing. 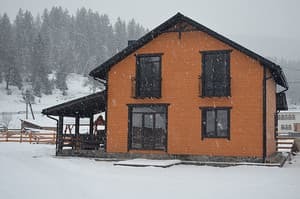 Heating: fireplace, electric heaters, floor heating. Water supply: cold and hot water is available all the time, a 100 l boiler is in each bathroom. Cottages are under the mountain, near the forest. In the courtyard there is a gazebo, barbecue facilities, and nearby there are hotel-type cottages. 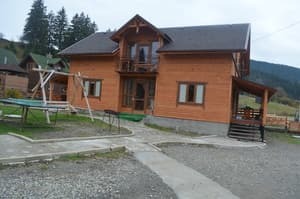 Описание номера: Cottage consists of 5 rooms. On the ground floor there is a common kitchen dining room with necessary equipment and utensils. In each room there are two single beds, a sofa, a closet, a bathroom. 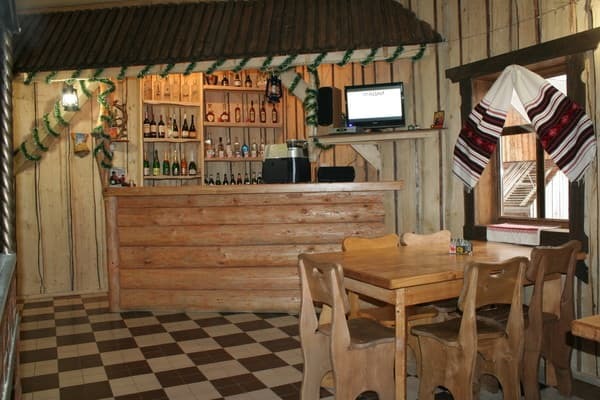 Описание номера: On the first floor there is a hall, four double rooms and a bathroom. Each room is equipped with two single beds that can be moved. On the second floor there are four double rooms, each with 2 single beds that move, a bathroom. Дуже зручне розташування. Поруч центр, магазин, автостанція. Неймовірно красиві краєвиди, що відкриваються з вікна. Все дуже сподобалось, зупинилися б ще не раз. Possible accommodation with two meals and cook yourself !!! 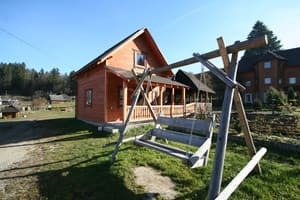 The cottage is located near the forest area in 200 m from the road, 900 m from the center of the village and 50 km from the Bukovel resort. A 10-minute walk from the cottage there is a ski lift and a spring with mineral water. By public transport: to Verkhovyna by bus, shuttle from Ivano-Frankivsk, get off in the center, then take a taxi or the owners will meet you with their car. By car: to Verkhovyna from Kolomyia or from Vorokhta to the center, to cross the bridge, to the right to the gas station, in front of the gas station turn on the signs and go about 200 meters.